Repeat the word “cheese” over and over again. Put a fat pretzel stick lengthwise between your upper and lower teeth. Look in the mirror as you practice your cheesy grins. I’ve never been a fan of ricotta cheese … until I taste-tested this recipe created by Juli Hale in the BH&G Test Kitchen. The recipe is ridiculously simple. The result is ricotta nirvana: pillow-soft mounds of fresh, creamy, sweet ricotta cheese. There’s an herbed version with lemon peel and garlic that I’ve been spreading on everything. Ummm, irresistible. State Fair judging, Round 3: Pies. I have a pie hangover. Why did I have those warm, sugary mini-donuts as I entered the fairgrounds in the morning? Even though I wasn’t judging the pie contest until 2 p.m., I knew better. I had no idea there would be 150-some pie entries. Luckily there were about 10 judges so we divvied them up. I only had to taste 9 pecan pies, 7 coconut cream pies, and 3 peach-raspberry pies. They brought me the 7 coconut cream pies first. Big mistake. I was so full of sugary-sweet custard and billowy whipped cream that my teeth were protesting before I started in on the pecan pies. My favorite? A pecan pie made with caramels and a generous splash of spiced rum. It didn’t take top honors tho because the caramel filling was way too runny. Good idea tho. The overall winner of the contest sponsored by the Machine Shed? A pumpkin pie with chai spices. Personally, I swing toward fruit pies. 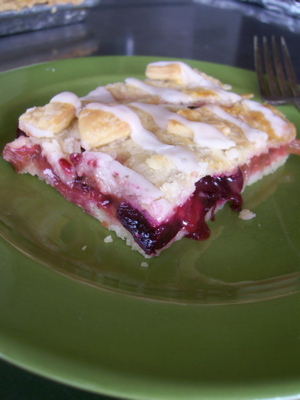 In case you missed this recipe some months ago, here’s my recipe for a “slab pie,” so called because it is baked in a jelly roll pan and is cut in slabs that will remind you of a bar cookie: a pie bar, if you will. I say, if you’re going to go to all the trouble of making pie, make a big, honking pie and have plenty to serve a crowd or to stash in the freezer for warming up when you’re in the mood. Dennis is making this for me on Sunday. we’re already drooling!!! 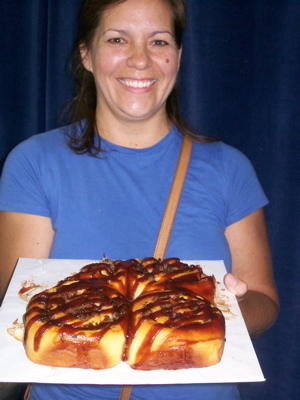 Funny thing happened as I was wandering among the 132 cinnamon roll entries showcased on table after table at the Iowa State Fair today. I shot a few overview pictures, then homed in on a few I thought were most uniquely attractive. But Kelly’s rolls have that wow factor. Slow-roasted pork tinged with the flavor of a cinnamon and brown sugar rub is shredded and placed on dough spread with cinnamon-butter. The dough is rolled traditionally, encasing the slightly sweet meat in its artsy spiral. 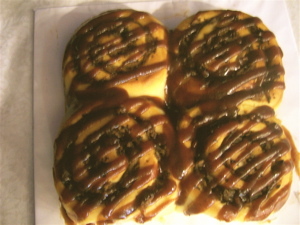 When baked, the roll is drizzled with barbecue sauce. Be still my heart. I am in love. 1. Preheat oven to 300°F. Start with roasting the pork. Mix the brown sugar, 1 tablespoon ground cinnamon, kosher salt, and black pepper. Coat the outside of the pork roast with this mixture. Place roast in a large roasting pan and roast uncovered at 300°F for 6 to 8 hours, or until the meat is tender and pulls off easily. When done, let roast rest until it cools off a little. Then shred with two forks, discarding fat and gristle. Set pulled pork aside. 2. Heat the milk and butter in a small saucepan or in the microwave until butter melts. Remove pan from heat and set aside until the mixture is lukewarm (about 100 degrees). 4. After the dough has doubled, press it down and turn it out onto a lightly floured work surface. Using a rolling pin, shape the dough into a 16 by 12 inch rectangle, with a short side facing you. Mix the ¼ cup softened butter with the ½ teaspoon cinnamon and spread over the surface of the dough. Spread a healthy layer of pulled pork over the surface of the dough, leaving a 1-inch open strip on one of the short sides. Roll the dough and when you get to the end, pinch it to seal. 5. Preheat oven to 350°F. Butter a metal 9 x 13-inch cake pan. With a sharp serrated knife, evenly cut roll into six equal slices and evenly place them swirl side up in the pan (2 rolls x 3 rolls). Cover with plastic wrap and allow to rise until puffy and almost doubled (about 1 hour). Gently brush with egg wash before placing in oven. 6. Bake rolls at 350°F for 40-50 minutes, or until the dough reaches 185°F-190°F on an instant read thermometer. Remove from oven and allow to cool in pan 10-15 minutes. Drizzle with your favorite barbecue sauce and serve. I think I am totally going to try these…I can see them tiny, too, as a twist on a slider, right??? Sometimes gorgeous doesn’t dazzle. 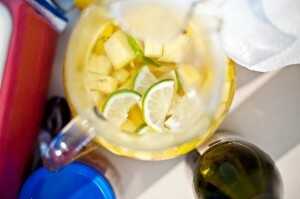 But, this pitcher perfect sangria blanca was wowza. It’s a Lindsey-fusion recipe. Food stylist Dianna Nolin volunteered to stir it together for a summery soiree we were throwing. 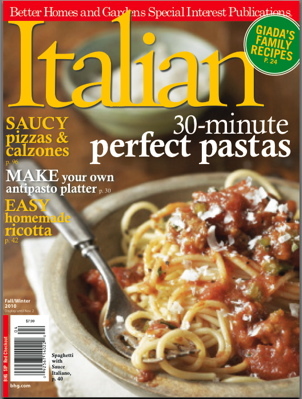 The moscato d’asti makes this a standout. It’s a lightly fizzed and subtly sweet low-alcohol wine. Perfect for sitting on the deck under the stars. But when used to concoct this sangria…oh. Oh. Oh. It’s a cocktail you can eat. And it tastes like summer. Makes 12 to 15 servings (more or less). *Moscato d’Asti is a low-alcohol wine, that is subtly sweet and with a hint of fizz. (about half the bubbly of most sparkling wines. Throwing a major party this weekend and am so not ready. As always, I’m in the last-minute throes of cleaning house, and oh, while I’m at it, let’s tackle my office, and look! A box of old checkbooks, bank statements, mortgage papers—a treasure trove for identity thieves. Surely I should shred every one of those gazillion documents RIGHT NOW instead of thinking about party planning and prepping. Aaaargh. I am so easily distracted. That’s why the party menu is going to be somewhat easy. Since it’s the kind of humid-heavy, hair-frizzling, mosquito-friendly summer in Iowa that makes you want to do nothing but sit in the kiddy pool with a fan blowing on your face and a cocktail in your hand, we’re serving up simplicity. 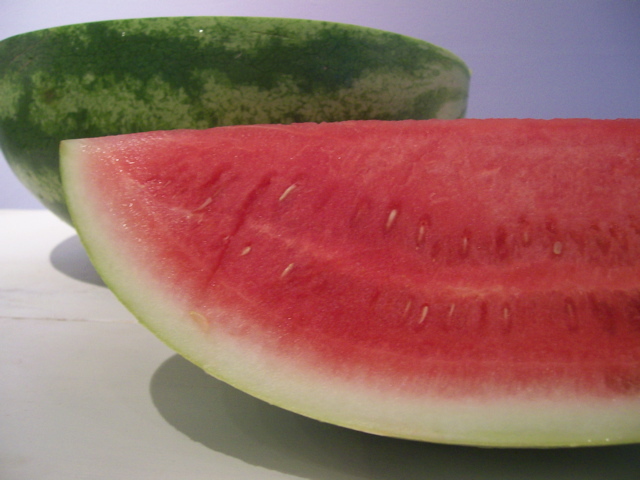 Watermelon comes to mind. Crispy cool and thirst-quenching. 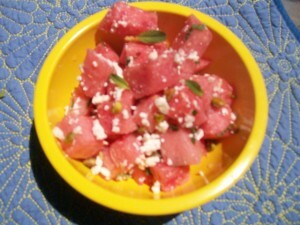 This spin on the watermelon-mint-feta cheese dish is my new favorite sum-sum-summertime delight. Makes about 3 servings (although I downed the whole bowl one day and called it lunch). 1. Toss everything except pepitas and cheese in a bowl. Sprinkle with nuts and cheese before serving. *Pepitas are the kernels of pumpkin seeds. So delish. Yahoo, can’t wait to see and hold your new baby… I mean BOOK!!! Many congrats for taking the bull by the horn….